Yesterday morning, my friend Sudha told me that Terry Pratchett passed away. It was fitting that Sudha told me because it was through Sudha that I was introduced to Terry Pratchett in the first place, many years ago, when we were in high school. I don't remember what my first Pratchett book was. I think it was Small Gods. Whatever it was, I loved it and I don't think I have gone a year since without reading a Pratchett book. I will be forever grateful to Sudha's ex-boyfriend Connor (wherever he is now) for introducing her, and by extension me, to such a wonderful author. It is difficult for me to put into words just how much Terry Pratchett has meant to me over the years. I could say that he is one of my favorite authors of all time, but we live in an age of hyperbole and I know that I gush about authors often. You wouldn't understand that my love for Terry Pratchett's writing is on a different level than my love for many other authors because there are only so many words in the English language to express fandom, and I overuse them all. 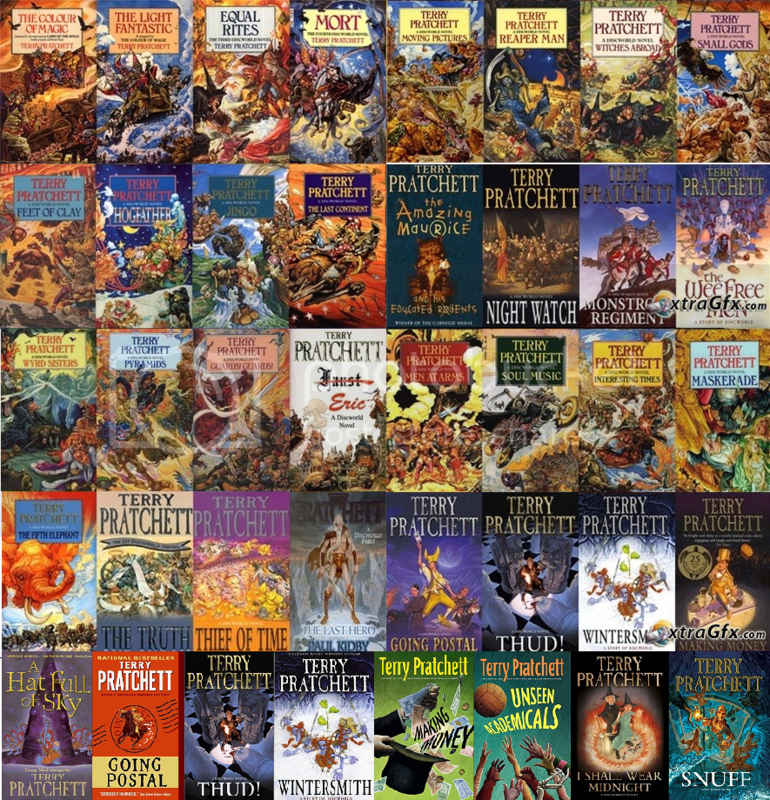 Suffice it to say that Pratchett wrote over 70 books in his lifetime, and he wrote prolifically for decades, and I still feel like he left us without enough. Pratchett tackled diversity before it was a buzz word. And he didn't just do it lip service - he really tackled diversity. He confronted women's rights with Equal Rites, he integrated the Ankh-Morpork police force with awkwardness and humanity and humor, he respected and then poked fun at organized religion, banks, government, and so many other things. And he made clear that ordinary people can be extraordinary heroes. I don't know what my favorite Terry Pratchett book is, or which of his characters I love the most. I loved the entire Discworld and the way all of his characters interacted with and learned from and treated each other. I'll miss Death and his SPEECH IN ALL CAPITALS. And the Death of Rats (SQUEAK). I'll miss Susan and Lobsang and how I imagine their happily ever after to be. I'll miss Tiffany Aching and her hilarious friends, the wee free men. I'll miss Commander Vimes and his entire watch team. Lord Vetinari. The Librarian and the Luggage. Unseen University. Rincewind. Lao-Tzu. I may even miss Moist von Lipwig. Pratchett wrote fantasy fiction but he was in no way limited by his genre. When I hear people say that they don't read fantasy novels, I become frustrated with their response mostly because of Terry Pratchett. Yes, his books feature other worlds and magic, but they also feature humor and wit and friendship and kindness. If you like The Daily Show or The Colbert Report, Tina Fey or Aziz Ansari, I think you would like Terry Pratchett. I don't think I really understood fantasy novels as being a vehicle to comment on our world until I read Pratchett. His ability to subvert the genre and pass judgment on our world at the same time was masterful. In a genre that is overrun with magical quests to defeat powerful oligarchs, Pratchett focused most of his attention on the police force and had a healthy respect for the efficiency offered by a dictatorship. In a genre that often overlooks women, he created a cast of powerful, wonderful, and kind females. And in a genre that values brute strength and magic and often veers into cynicism, Pratchett stood firm in his belief that good people can make the world a better place. And proved his faith by making sure that the good guys won. In every book. Because while Pratchett was searingly clear about all the ways in which the world disappointed him (and disappoints us all), he also made sure that you ended every book knowing that good people doing good things makes the world a good place. Rest in peace, Sir Pterry.
" Because while Pratchett was searingly clear about all the ways in which the world disappointed him (and disappoints us all), he also made sure that you ended every book knowing that good people doing good things makes the world a good place." This is so true, and I value it so much - his honesty about how awful things can be, and his refusal to be hopeless at the same time. Because people CAN do the right thing, and when we do the right thing together the world becomes better. This is such a lovely tribute. Thank you for sharing it. I am still a bit in denial myself, and also clinging to the faint rumors of a Tiffany book still to come. I still remember my first, Monstrous Regiment, and how fast my collection grew from there. That is such a lovely tribute and so true. Terry Pratchett's books will always be something I come back to when I need re-assurance. And I agree with you that the way he tackled diversity and humane-ness is exemplary. I was so happy when AS Byatt championed his work because I do believe there is a seriousness to his novels that many dismiss because it is fantasy. And they are so wrong. He left us with so much but there could have been so much more. So sad. I didn't think it was going to happen so soon. I haven't been able to write my own tribute yet because there is so much to say and no words are doing it justice. I am embarrassed to say that I've only ever read Good Omens, and that was due to Neil Gaiman. I clearly need to read Pratchett, but there are just sooooo many books it's overwhelming.